We make everything here at the kitchen from the freshest ingredients available. The sausage is made and smoked in-house and is available for purchase by the pound. Choice of (Beef and Onion), (Cabbage Sauerkraut Mushroom Onion), (Potato Onion Cheese) topped with Bacon Crackling. Our own pickled Atlantic Herring recipe. Herring and Onion packed in marinade and pickled over two days, served with Bread. (omit bread for GF). Hunters (Dry) Stew made of Beef, Pork, Kielbasa, Ham, Cabbage, Sauerkraut, Mushrooms, Onions, Tomato Paste, Prunes, Red Wine. Seasoned with Salt, Pepper, Bay Leaves, Peppercorns, Juniper Berries, Marjoram. Served with Buttered Boiled Potatoes topped with Dill. Served with Rye Bread on request. 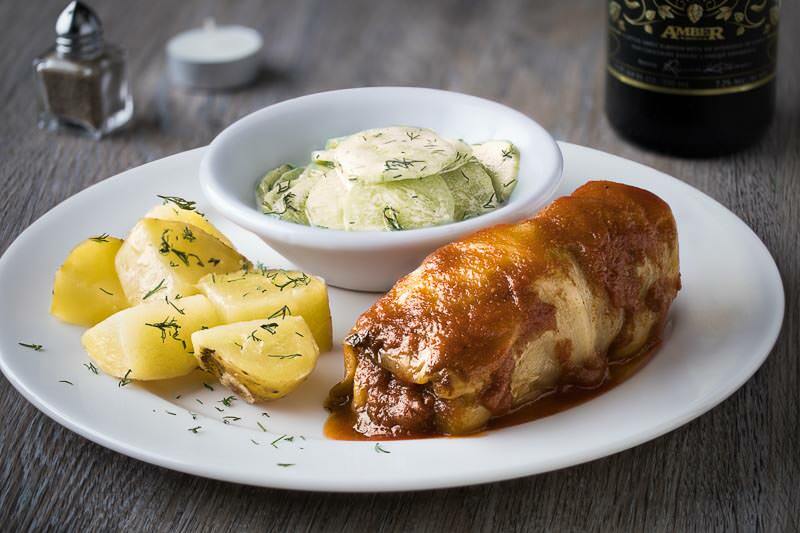 Our own version of the classic Cabbage Roll. Fresh Ground Beef Chuck and Pork Shoulder combined with Rice. Seasoned with Salt, Pepper, Paprika, Onion Powder. Topped with Tomato Sauce flavored with Worchester Sauce. Served with Buttered Boiled Potatoes topped with Dill. Choice of Surowka, Buraki or Veggies. Breaded and Fried Ground Beef Patty mixed with Egg and Onions topped with Mushroom Sauce and Dill served with Boiled Potatoes and Choice of Surowka, Buraki or Veggies. Chicken Breast filled with Herbal butter, mixed with Garlic and Parsley. Rolled, skewered, coated with Egg and Bread Crumbs, fried until golden brown and roasted in oven until done. Served with Buttered Potatoes topped with Dill. Omit the bread crumbs to make a gluten free option. We will brown it naked in butter then finish in oven. Choice of Surowka, Buraki or Veggies. 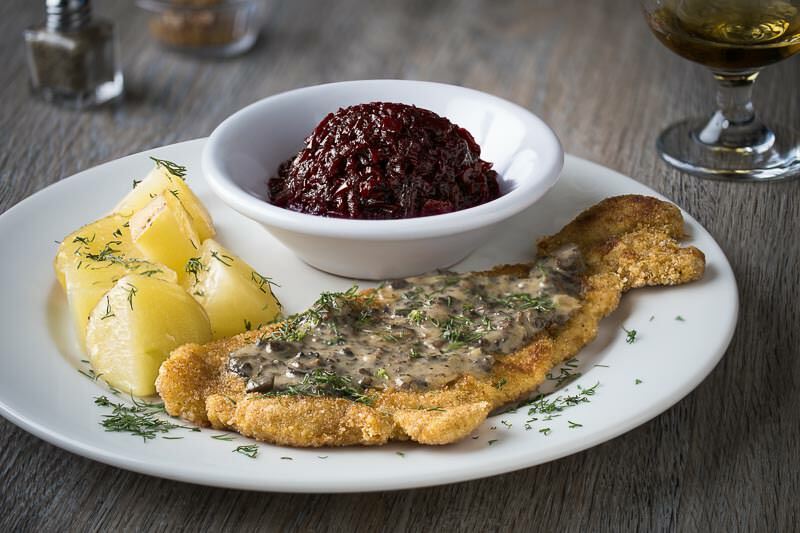 Pork Cutlet (Pork Tenderloin), seasoned with Salt and Pepper, covered lightly with flour, dipped in egg, coated in bread crumbs and fried in butter. Served with Buttered Boiled Potatoes with Dill. 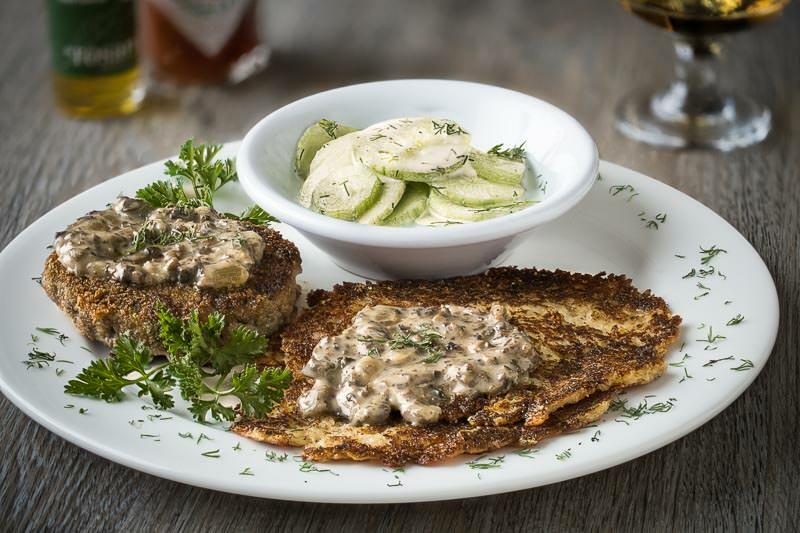 Fish Cutlets made with Wild Caught Sole, ground with Sautéed Onions, mixed Bread, Eggs, Milk, seasoned with Salt and Pepper, rolled in Bread Crumbs, Grilled served with a side of Homemade Tartar Sauce, Boiled Butter Potatoes topped with dill. Slightly Pickled Flavored Salad, made of chopped Sauerkraut, Onion, Shredded Granny Smith Apple, Shredded Carrots, mixed with Vegetable Oil and Sugar. Simple Beet Salad with a Sweet Taste-Cooked Shredded Beets with Sautéed onions mixed with Balasamic Vinegar. Not hungry for a full meal but want a taste of tradition. Single serving cabbage roll. Our own in-house made smoked version of a polish favorite. Add a Surowka or Burakow Salad to make a nice meal. A delicious non-smoked Sausage made of Ground Pork Shoulder. Seasoned with Salt, Pepper, Garlic, Marjoram. Served Boiled. 3 Crepes filled with Handmade Sweet Farmers Cheese. Folded into triangles, fried crisp, Topped with Choice of Handmade Blueberry, Cherry, Strawberry compotes. Sprinkled with Powdered Sugar. Order a single if 3 are too many. Polish traditional Cheesecake with Handmade Farmers Cheese (Twaróg) with Lemon and Orange Zest. Graham Cracker Crust. Whip cream on request. ~ Includes Choice of Handmade Blueberry, Cherry, Strawberry Compotes. Daily Dessert Special - Ask What's Available. 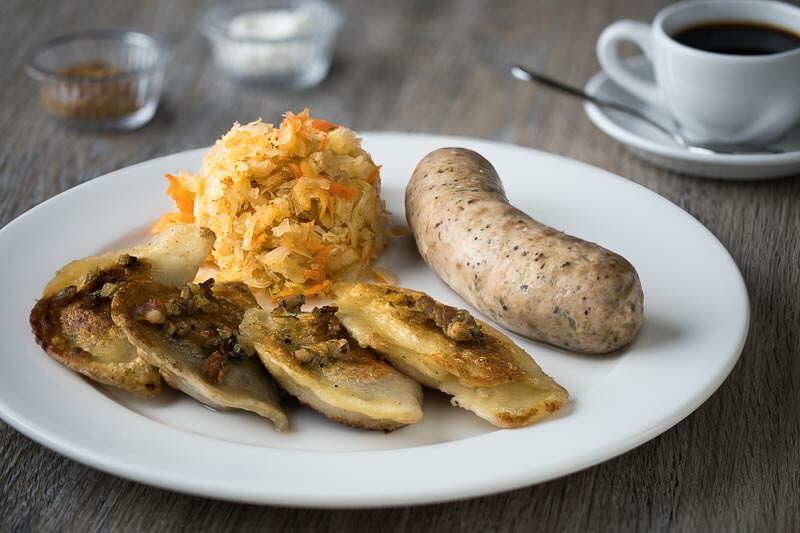 Polish food cannot be fully appreciated without a great tasting Beer or an exceptionally smooth Vodka. We offer a full bar comprised of imported and domestic liquors. For our wine enthusiasts, try our award winning Bulgarian wine Sophia processed with grapes from the Bordeaux and Champagne regions of France. Coffee flavored top of the line Polish Beer with a very smooth texture. A favorite! Similar to a Guiness Style beer. Made from malted barley. Very smooth and delicious beer. An amber wheat beer, unfiltered, pasteurized made of wheat malt, barley malt, hops and yeast. A Polish favorite. Brewed with barley, hops and pure mountain water. Wine with a golden color, mild avor of sunny summers and refreshing aftertaste. A white wine similar to a domestic Riesling. A light golden color, crisp avor of summer fruits mixed with the smell of tannins and a very clean finish. A crisp and refreshing wine with oral and honeysuckle aromas, accented with acacia ower notes. Try it with our Kotlet z Drobiu. The colour is dark red, the taste is fruity and luscious, with soft tannins and intense fruit flavours of cherries and mild spices. Easy on the palate yet rich in taste. Has excellent aroma, intensive color and good balanced tannin structure. It combines nuances of herbs and fruits. Dry long lasting finish. The Best Mead in Poland. Exceptional quality and taste. Authentic Honey Wine direct from Poland. Very smooth similar to brandy but with a sweet taste. Available flavors Plum or Choke Berries. Sweet aperitif style wine. Can be sipped before a meal or enjoyed as a dessert after dinner. Made from fruit other than grapes. Ask for available flavor. Prices subject to change without notice. Sales Tax not included in prices.